U.S. Political Stats brings together thousands of data sets on all 3 branches of the U.S. government, allowing users to create visualizations and compare data with a few simple clicks. Designed to be intuitive for the novice researcher, yet robust enough for senior political scientists, the platform allows users to create graphs, charts, and maps to allow for a quick analysis of data trends. Data can also be exported to allow for more in-depth manipulation and analysis. 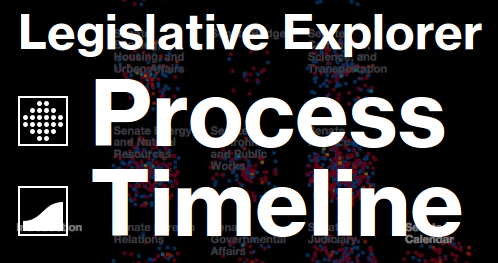 Compare bills and resolutions introduced by Senators and Representatives and follow their progress from the beginning to the end of a two year Congress. Filter by topic, type of legislation, chamber, party, member, or search for a specific bill. Very appealing and dynamic way of presenting data. Election data from 1800 - 2016.